Photo from Kurt Busch via Twitter. Stewart-Haas Racing driver Aric Almirola won his first race since joining Stewart-Haas Racing with his victory Oct. 14 in the 1000Bulbs.com 500 at Talladega (Ala.) Superspeedway, but his teammate Kurt Busch nearly won the race after a dominant performance. Busch led a race-high 108 laps and was leading on the final lap when he ran out of fuel and wound up 14th. 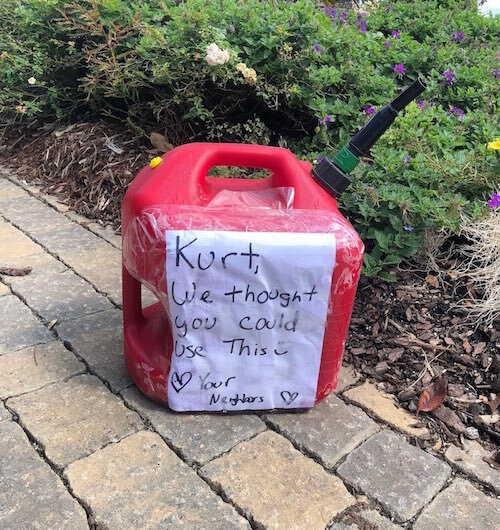 Busch returned home from Talladega to a reminder of his near-win from his neighbors. Busch and his three SHR teammates, also including Kevin Harvick and Clint Bowyer, ran first through fourth throughout much of the race. Harvick also fell victim to fuel mileage, needing to pit during the final caution that sent the race into overtime. Bowyer finished second to Almirola. After the race, Busch questioned a couple of late-race decisions by NASCAR that he felt cost him the race. The driver thought the final caution went one lap too long, making the race one lap longer. Also, Busch thought the race should’ve ended under caution after a last-lap crash while he was leading. Busch is likely to advance to the third round of the playoffs after Sunday’s second-round elimination race at Kansas Speedway, as he is fourth in the standings. The playoff field will be cut from 12 to eight after the Kansas race.